It has now been six months since I spent a day traveling around the countryside of western Ukraine on the Golden Horseshoe castle tour. The sights and experiences of that day have stayed with me. The memories are still strong of my fellow passengers, the three castles I visited and of the gloriously ruined Roman Catholic Church of St. Joseph at Pidhirtsi. Yet it is what I cannot remember that now occupies my thoughts. 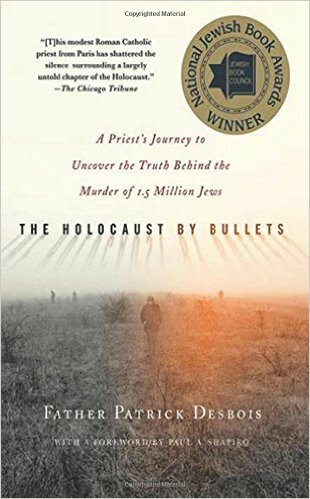 This lack of memory was recently provoked by a chapter I read in The Holocaust by Bullets: A Priest’s Journey to Uncover the Truth Behind the Murder of 1.5 million Jews. 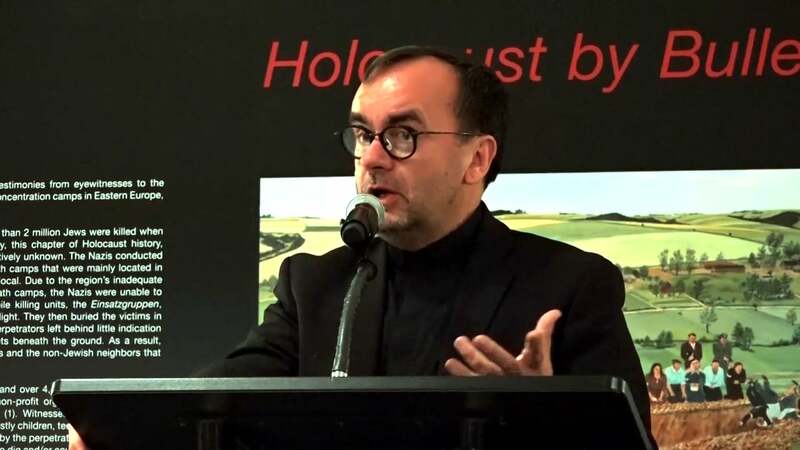 The books tells the story of a French Catholic priest, Father Patrick Desbois and his years long work to locate the execution sites and mass graves of the Jews and Roma murdered by Nazi death squads during the Holocaust. This method of execution was carried out prior to the inception of industrialized murder with gas chambers. There are literally thousands of mass graves across Poland, Romania and areas in the western part of the former Soviet Union. Desbois and his teams of interpreters, photographers and researchers have managed to locate over a thousand mass graves by interviewing elderly villagers who witnessed these shootings. These interviews, along with forensic fieldwork, have led to horrifying discoveries. Over a decade after his work began, Desbois continues to find sites throughout the region. In the book Desbois relates how he and his team developed their method of finding the mass graves. In each chapter he names different places where discoveries were made. Many of the places can be found close to villages or small towns. 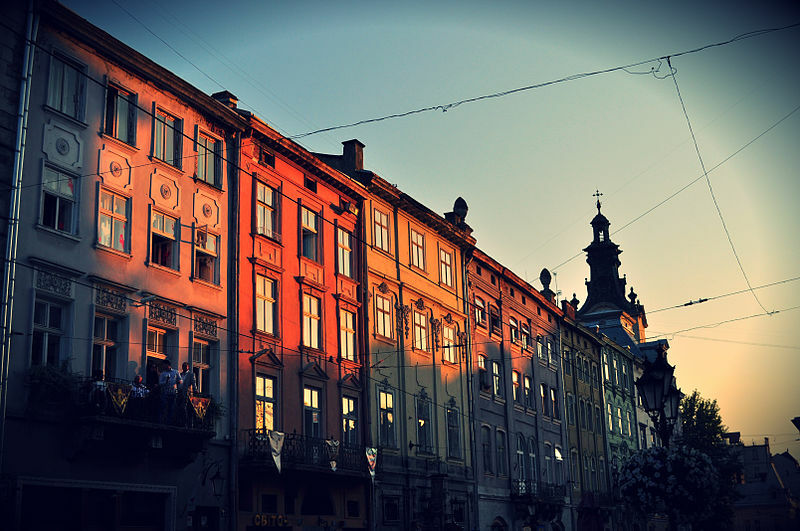 Mass executions also took place on the outskirts of more sizable cities, including Lviv. After reading each chapter I would look up the different places that were named on a map, trying to see if I been anywhere near these sites. Each search filled me with trepidation and ominous foreboding. I was suspicious that I might have unwittingly crossed a site while jogging in the forest that is part of Lviv’s Lychakiv district, specifically the Kaiserwald (King’s Forest) where I had come across trenches and undulations that were almost certainly manmade. I surmised that these were probably dug during World War I, but I could not easily dismiss the possibility that they were the setting of even greater horrors than an organized battle. It turned out that shootings did take place in woods nearby, but not in the Kaiserwald. Less than a mile away, in another forested area known as Lysynchi, 90,000 Jews were executed by the Nazis over a period of months. Desbois and his team discovered these mass graves. The figure is difficult to process, until one realizes the massive scope and scale of the Holocaust By Bullets. Almost anywhere in western Ukraine is within a half hour drive of an execution site. 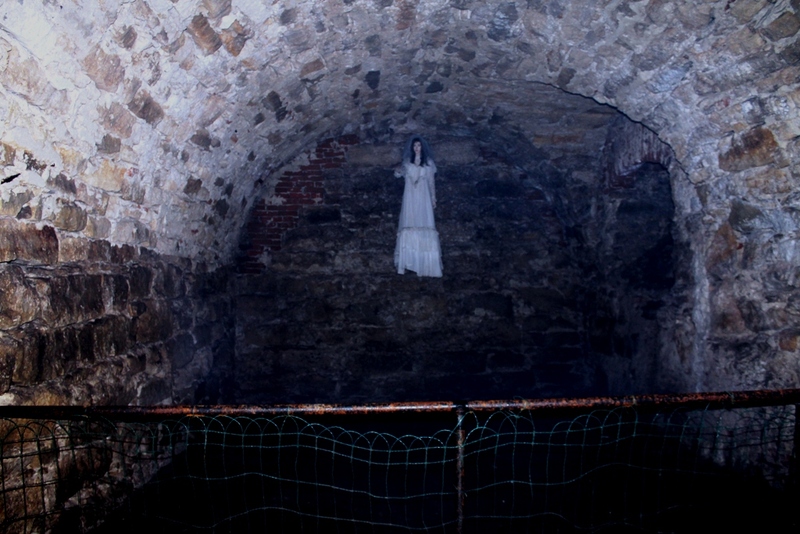 The most frighteningly personal of these places are often found in the remoter reaches of the countryside. In serene settings where murder seems just as imaginable as the Holocaust was. One of these rural execution sites/mass graves was not far off the Golden Horseshoe route. I never would have known the proximity of this site to the tour route without having read Father Desbois’ book. The time it took to ride between Olesko and Pidhirtsi Castles on the Golden Horseshoe tour was just 15 minutes. The only memorable part of the ride was caused by an abrupt deterioration in road conditions after leaving the M06 highway. Just before the turn off we skirted a village by the name of Khvativ. I cannot recall anything memorable about it. Then again why would I? The village occupied one of those in between spaces of travel. This is a place between two stops, where most of a trip occurs, but is rarely worth noticing. Khvativ acts as a quintessential “wide spot in the road.” There really should be nothing of historical interest in Khvativ. If only the Holocaust By Bullets had not left lasting and deadly scars upon this otherwise mundane village. In the woods not far from Khvativ, Desbois and his team used a metal detector to find 600 German cartridges, the last remnants of mass murder. 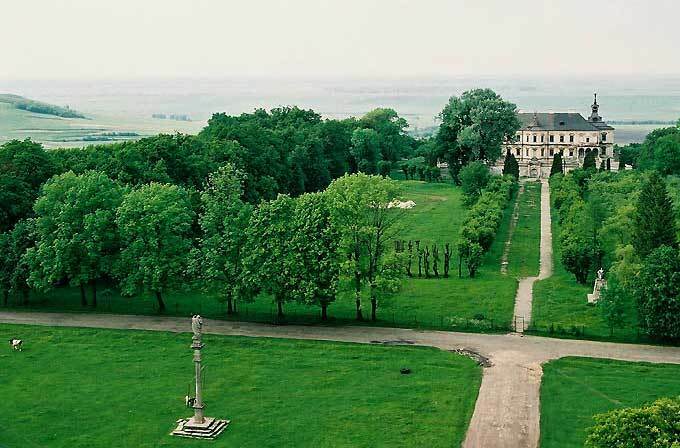 The woods in which the site was discovered were part of the panorama seen from the grounds in front of Pidhirtsi Castle. I can remember standing there, admiring the view of the surrounding forest and agricultural lowlands. Little did I know of the horrors that took place nearby, then again little did anyone know until Father Desbois made the discovery. The people who did know still lived in the village. One of them provided a story that brought home the personal nature of mass murder. The spiritual value of Desbois’ work is that it has restored dignity to the Jews who were murdered. The Jews of western Ukraine are no longer in anonymous graves in forgotten fields. They are real people with voices that can now be heard. They are mothers, fathers, daughters, sons, neighbors and friends that have been given life, rather than having it taken from them. Olena may have been helpless to save her mother’s friend on the day of the mass murder, but through memory and with the help of a skilled interlocutor she was able to bring that person back to life. Thousands of other witnesses have found the courage to raise their voices with the help of Desbois. This process has brought a voice to the voiceless and given life to the murdered, not just for a moment, but for all time. “Olena, Olena save me.” The cry was not in vain. More humanity resides in those words then was to be found in the entire Third Reich. Upon leaving Olesko I was filled with anticipation. 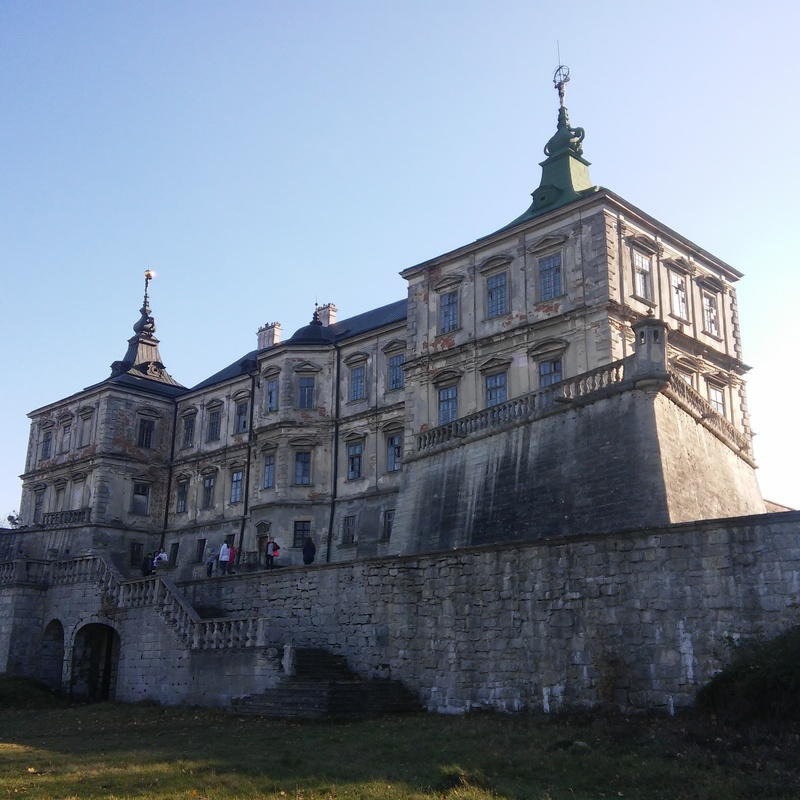 My main reason for taking the Golden Horseshoe Tour was to see one castle, Pidhirtsi. 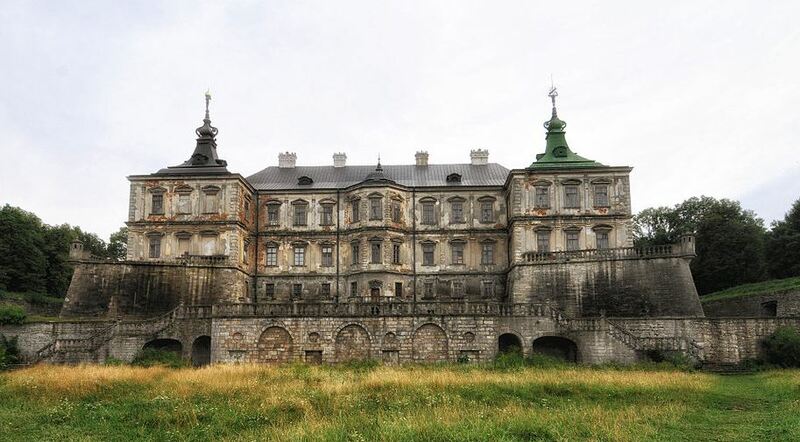 As far as appearances go, it is renowned as the preeminent castle in Ukraine. Austere and foreboding, Pidhirtsi is the very definition of brooding. I had spent many hours studying photos of the castle and also wrote two long blog posts on its history, both factual and legendary. 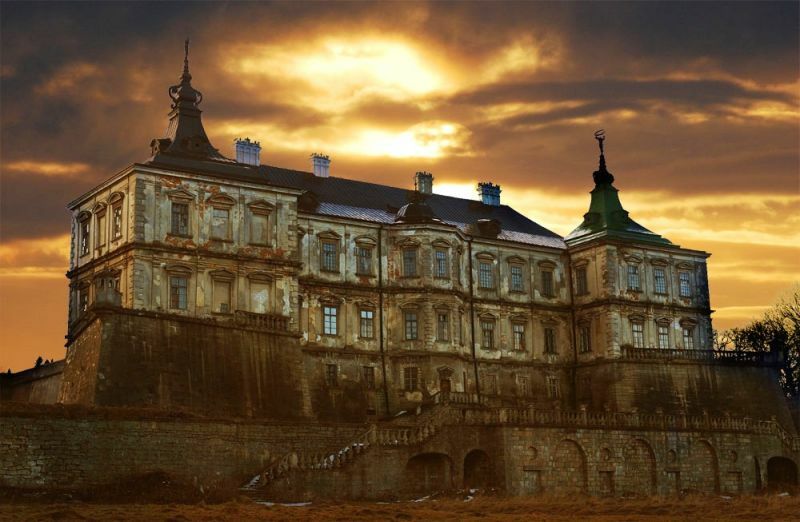 For me, Pidhirtsi Castle became the world’s greatest haunted house. Not because of the legends surrounding it, but because of its ominous, gloomy appearance. A photograph of it at dusk was enough to make my imagine run wild, conjuring up terrifying events happening within the walls. Every window seemed to have someone or something peeking out from it. There was a magnetic decadence about the place. The castle was both dream and nightmare. I was drawn to it by fear, but also vanity. This had become my must see, less for historical or architectural interest than personal vanity. The fact was that I had to visit Pidhirtsi, to take photos of this magnificent architectural monstrosity. 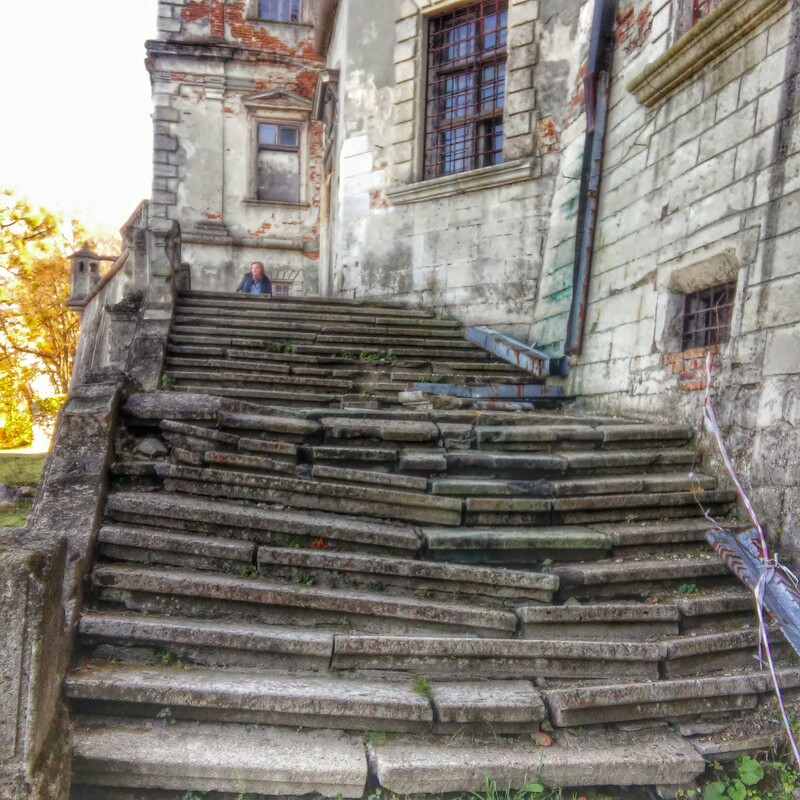 I could not leave western Ukraine without showing hard evidence that I had been to Pidhirtsi Castle. Like all objects of vanity, it meant more to me personally than to any real or imagined audience. Pidhirtsi was the only thing that would make this trip complete, or so I assumed. The ride from Olesko to Pidhirtsi was not far, only 13 kilometers (8 miles), but I felt every inch of it. I was not surprised that this secondary road was laden with crater sized potholes. This is what I had expected from the start, but it was still a jarring and deeply unsettling experience. There was no use trying to read my guidebook and catch up on a few facts before we arrived. I nearly got motion sickness after a couple of minutes trying to make it through a single sentence. The teenager beside me was not still altogether comfortable with my presence. His head had been hugging the window since we started. Unfortunately for him, each time the bus struck a pothole, which happened about every 50 meters, I was thrown into him. He winced, I expressed a condolence, he half-heartedly smiled and the process was repeated every half minute. For some reason, this road reminded me of another horrible one I had been on in eastern Kansas two months earlier. The difference was that in Kansas the road was dirt, while this one was paved, sort of. For me, there is nothing worse than a bus ride on a bad road. An incredible amount of energy is wasted trying in vain to steady myself. The twenty minutes of shaking, jolting and jarring, seemed much longer than the hour and a half it had taken to get from Olesko to Lviv. The one thing I dread in the farther reaches of Eastern Europe, much more than corruption or fears for my personal safety, are bad roads, That is because bad roads combine both of these. Corruption, since the roads are bad because the transport funds to fix them were stolen. Personal safety, as vehicle accidents often result from the terrible roads. Fortunately this ride was short in length, if not in experience. 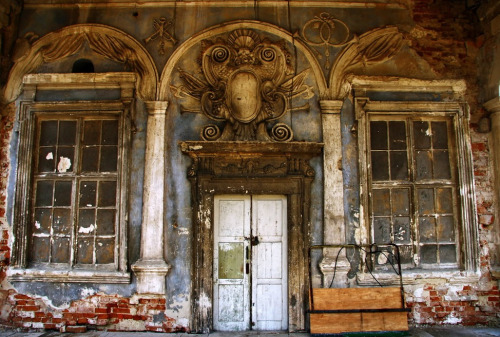 As I eagerly looked out the window, anticipating a first glimpse of Pidhirtsi, another large and dilapidated building came into view. My gaze fixed on a church in a state of slow ruin. This was the Roman Catholic Church of the Exaltation and St. Joseph, a crumbling pile that bore the scars from successive World Wars. To say that the building was worse for wear would be a dramatic understatement. The church looked as though it were one stiff breeze away from total collapse. It made for a magnificent set piece juxtaposed with its rural setting. Looking like the last remaining vestige of a lost civilization, left stranded and forgotten in an empty field. The words neglect, desertion and abandonment immediately came to mind. Yet there was something magnificent about the edifice, with its front portico held up by fourteen columns, atop which stood weathered statues of saints standing as silent, holy sentinels. Attached to this was a Baroque style church topped with a form fitting dome. 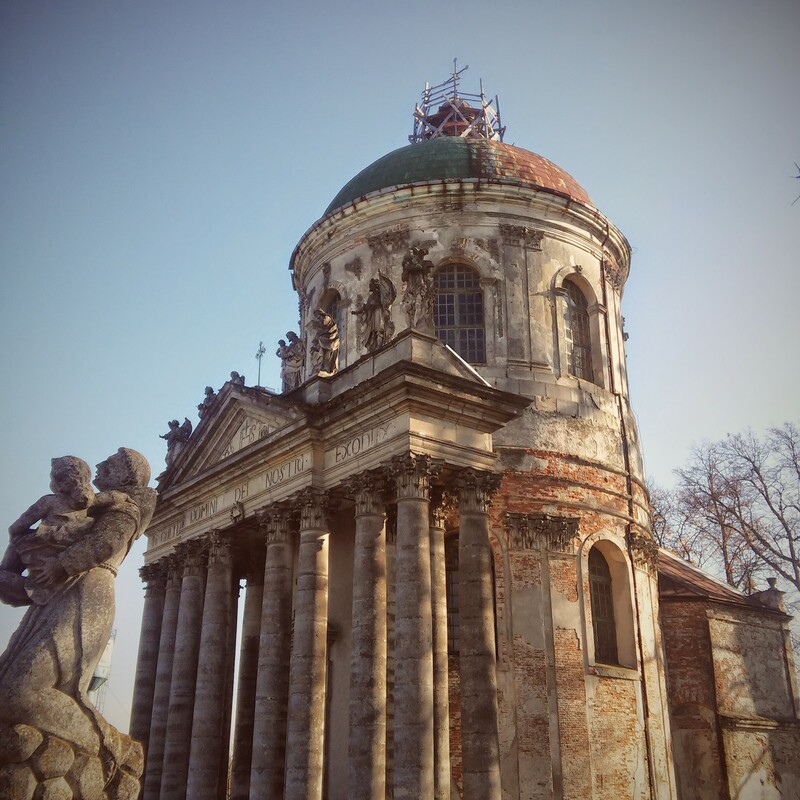 The church had been constructed by order of the Polish magnate Waclaw Rzewuski and was built as a tomb. By the time of its completion in 1766, construction had taken fourteen years. The effort had been worthwhile. The church had somehow managed to withstand multiple wars where one army after another shot, pillaged and tried to destroy it. The impression of the church in its decayed and degraded state was fantastic. 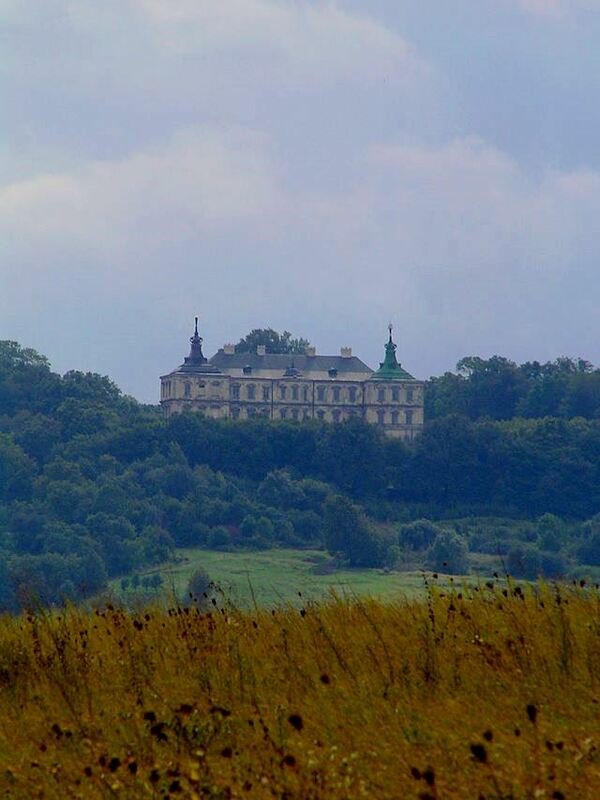 It drew my attention away from Pidhirtsi Castle, which the Church was meant only as an accessory. Between the church and the castle ran a 300 meter (984 feet) long path lined with linden trees. As the tour guide began chattering on in Ukrainian I quickened my pace in order to get my first full view of the castle. Maybe it was because we approached from the back side, but the structure was not nearly as awe inspiring as I had imagined. The reality could not match the image I had built up in my mind. The sheer size of the castle was disconcerting. It was hard to grasp that one building could be so large. 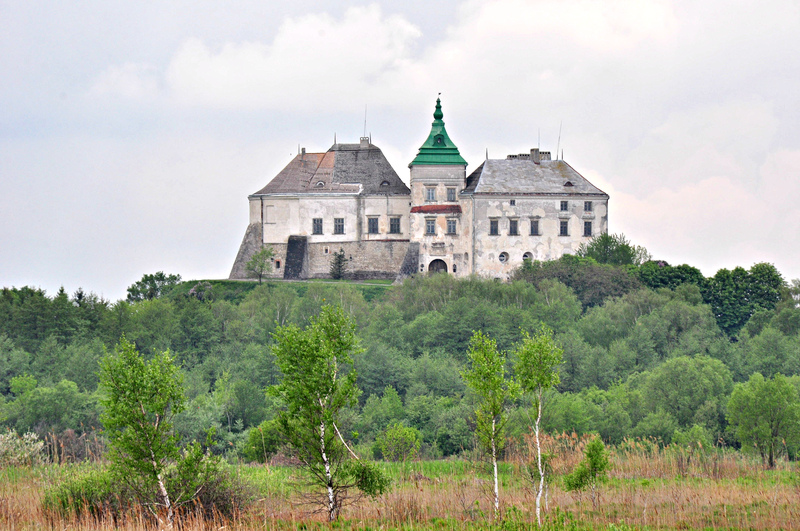 Unlike castles that incorporate a range of buildings, Pidhirtsi was a castle, fortress, palace and manor house, a truly one size fits all concoction. Being a bit of everything had its drawbacks, making it less interesting than I imagined. While impressive, it was hard not to see Pidhirtsi as just that, something built mainly to impress. And that is just what it did, especially during its glory days in the 18th and 19th centuries under the ownership of the Rzewuski family. Festivals were held at the castle that went on for weeks. These affairs mixed the light and the serious, with military parades and weapons firings, fireworks and formal balls. The castle was home to world class paintings, rare birds, a voluminous library and rare furnishings. An inn was built on-site to house guests that came to frolic for days at a time. They could attend performances at the castle theater which had its very own orchestra. 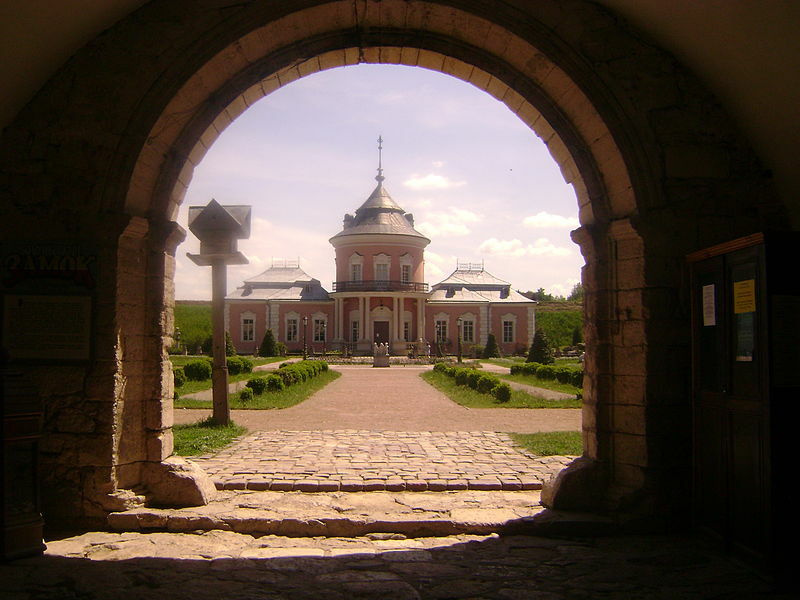 Pidhirtsi was a sort of early modern age Disneyland for the Polish nobility. Unfortunately, due to restoration work we were not allowed to go inside. I was a bit suspicious of this, since from the looks of it, Pidhirtsi could have easily housed a small town. Then again, I have no idea what kind of danger may have lurked within, not from the well-publicized ghosts, but from falling beams or collapsing floors. By the time I made my way around to the front of the castle I was a bit irritated, I had two cameras and neither could capture the size or scale of Pidhirtsi. I finally settled on a series of frontal shots that portrayed less drama than I had hoped for. My greatest thrill came from taking photos of stone steps that looked to have been placed haphazardly, one atop the other. There were also balconies missing parts of their banisters. The closer I got to the castle, the more I feared an accident. This was history without rules, regulations or interpretation. Here was a castle for the taking, unfortunately that could mean the taking of great risk with one’s personal health and safety. Pidhirtsi was a scary place, but not for the reasons I had imagined. It was no house of horrors. Instead, the castle was big, brash and falling apart. Up close and personal, the exterior looked and felt dangerous, an accident waiting to happen. A place made for slips, trips and falls. The castle, at least externally, did not feel like the home of apparitions, it felt more like a super large building with structural deficiencies. Not what I had imagined. My dreams of Pidhirtsi were very different from the reality. I made my way back towards the bus a good half hour before the allotted time was up. I found myself once again walking over to the crumbling church. I stared at it for quite some time and then took several more photos, almost as many as I had taken of the castle. It had become the center of my attention. The church drew me in closer. Why was this? What did it mean? I could not come up with the answer in that moment. All I had was a feeling, of being lost in a lost world. Only upon later reflection did I discover a meaning. For me, the church in all of its devastated deterioration was a reflection of this land and its inhabitants, a symbol of civilization, forever falling apart, and somehow still standing. It is a surreal feeling to come face to face with your past. A past that you hardly remember and really have no reason to recall. On a day that was supposed to be all about something new, I found myself confronted with someone I had briefly met four years before. It was a sunny and crisp autumn morning last November in Lviv as I stood outside a building at 2 Cathedral Square (Ploscha Katedralna). This was supposed to be the meeting place for the Golden Horseshoe Tour. 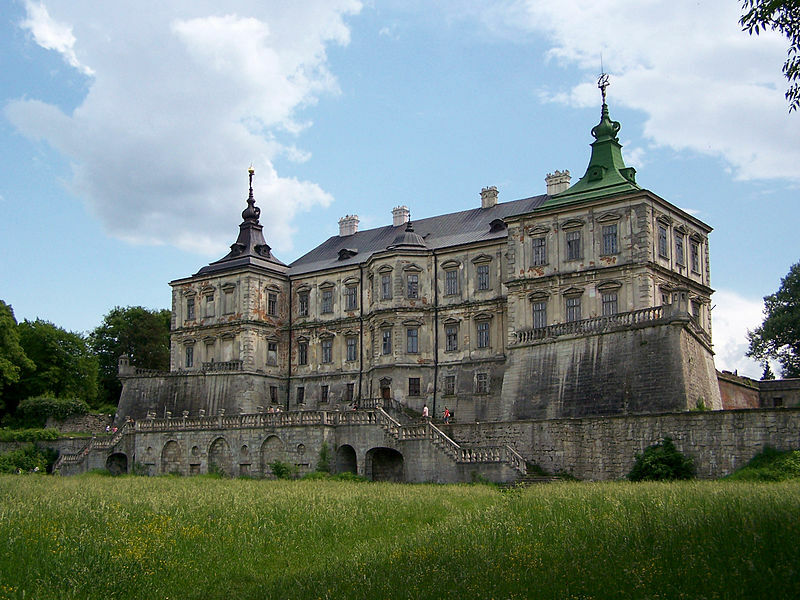 A guided tour that would take me to visit Olesko, Pidhirtsi and Zolochiv castles in western Ukraine. The building I stood in front of was not yet open, no one else was around and it was almost 8:00 a.m. I started to get a little worried since it was already the tail end of the shoulder season for castle tours. Perhaps no one else had signed up. The tour might have been canceled, but how was I to know. Then slowly a woman began to walk toward me. Her hair and clothing was a bit disheveled and she had a sleepy eyed, languid look. There was something about her that was strangely familiar. An odd sense of déjà vu came over me. I had seen this woman before, but where. Slowly it began to dawn on me. Had anything really changed during the intervening years? Of course it had, but at that moment time seemed frozen. We recognize the passing of time not by looking in a mirror, but by looking at someone we have not seen in years. In this case, that truism was reversed. Seeing this woman again made me feel like time had not passed at all. It was a disturbing feeling. Between these two chance encounters my life had been filled with unique experiences, but as far as my visits to Lviv went, little seemed to have changed. When she made it over to the building I told her what I was there for, she unlocked the door and told me to wait outside. Her English was still relatively poor. She looked like she had just crawled out of bed. Inside the building she made a quick phone call, then came back outside and told me to follow her. But to where? “Just come with me” I was told and was soon to find out. Anytime I am in a foreign country and someone tells me to follow them, I immediately get suspicious. Visions of thugs pummeling me in vacant alleys immediately come to mind. Whether this paranoia is logical or not is beside the point. Paranoia is not logical, traveling in a country where you can hardly speak a word of the language nor read the alphabet is not logical. Following strangers who give you few indications of where you are going is not logical. Now putting your trust in another person you hardly know may seem logical to some, but it is certainly not common. When traveling in western Ukraine, I am not looking for a near death experience I am looking for an adventure. Most importantly, I am not looking to get robbed. After all, getting robbed at eight in the morning would make for a very bad start to the day. In this case, there really looked to be no chance of that, but one never knows. The sun was out, birds were chirping, Rynok Square was coming to life as I dutifully followed this woman. She did not so much walk, as aimlessly wander. Attempts at conversation were futile. We proceeded northward from the square down Krakivska Street until we came to the mesmerizingly unpronounceable Knyazya Yaroslava Osmomysla Square. There stood a man outside a large bus with slightly tinted windows. The woman said a few words to him in Ukrainian. He looked at me, nodded his head toward the open door of the bus and said “Get in.” Where was everyone else? I soon found out as I walked up the steps into the bus, there were at least thirty Ukrainians staring straight at me. I have scarcely felt more foreign in my life. There was only one open seat left. Thankfully it was close to the front. I felt everyone’s eyeballs move with me as I made my way forward. While taking an aisle seat, I noticed that the teenage boy who would be in the window seat beside me, moved as close as he could get to the window pane. His head was resting on the pane of glass. The poor lad looked scared and miserable. He was going to spend a whole day sitting beside a strange foreigner. We were now inseparably linked, both in the dreaded position of being outsiders. The strange thing is that in these moments, I feel most alive. To be heading off down an unknown road, with people I have never met, to look at castles I know little to nothing about, this is what I live for. As the bus began to pull away from the curb, I realized that this was going to be a day to remember, a day spent on the trail of the Golden Horseshoe.